We produce a quarterly community newspaper. We publish Fitzrovia News, a volunteer-led project to deliver a free community newspaper four times a year to every residence in Fitzrovia. It is led by a professional journalist with assistance from other local journalists and editorial decisions taken collectively at public monthly meetings. The paper is financially supported by advertising from local businesses and by public donations. This project helps meet our objective of improving the life quality of those who live and work in Fitzrovia by informing them about the neighbourhood and providing access to local information as well as promoting the activities of our own and other organisations in our neighbourhood. It also helps us to meet our objective of the advancement of education by giving people the opportunity to write for the paper and gain communication skills. The newspaper is delivered by volunteers to every street in Fitzrovia and left in collection points throughout the neighbourhood. Distribution of the paper is organised by volunteers and offers the opportunity for people to explore their neighbourhood by delivering newspapers to residences that they may not be familiar with. It also provides the opportunity for social interaction and meets the objective of providing recreation. 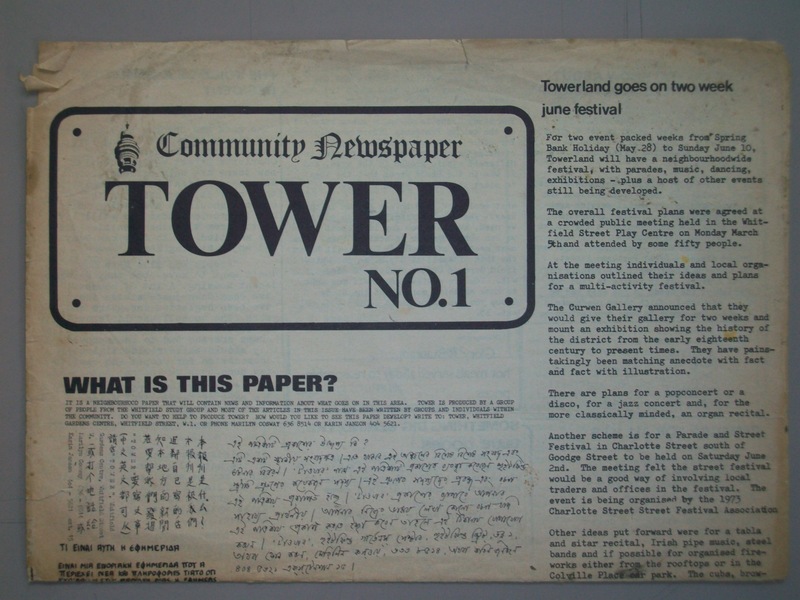 The first community newspaper in Fitzrovia was Tower, produced from 1973. In the 1980s Fitzrovia News was produced. 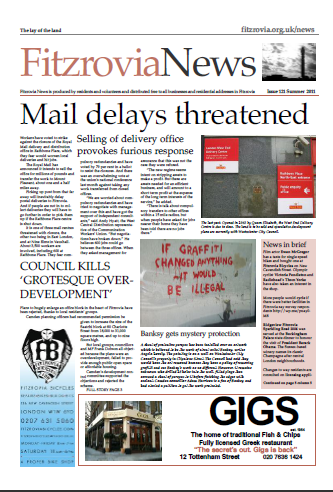 In November 2009 we launched an online version of the newspaper where we published a selection of news stories. This helped to raise the profile of Fitzrovia News and attract funding from advertisers. In March 2010 we launched our social media network. The gave us the opportunity to attract new readers through the social networking sites Facebook and Twitter. The first community newspaper in Fitzrovia was called Tower, first produced in 1973. In 1980 Fitzrovia Neighbourhood News was produced, becoming Fitzrovia News later. During 2012 we began to digitally archive every issue of Tower and Fitzrovia News and we are to complete this project early next year. You can view the archive in progress here. The archive project has been created entirely by volunteers. The outcome of this project is that people are able to contribute collectively to producing a paper and help inform one another about our neighbourhood. People are better informed about activities in Fitzrovia and more knowledgeable about their neighbourhood. The Fitzrovia News also realises the outcome of strengthening the community by bringing people together and providing them with a voice.